This collection of partial sum worksheets assists high schoolers in practicing the skills that comprise evaluating the nth partial sum of the infinite series, with the series represented in general form and summation form, determining indicated partial sum, finding the infinite sum with the given nth partial sum, identifying indicated term of the series and much more. 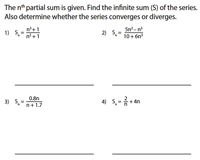 Students require to find the partial sum of the given infinite series by identifying the terms and finding their sum. Use the answer key to verify your solution. These worksheets involve arithmetic, geometric and special series. 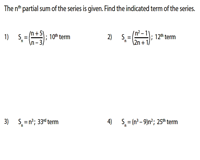 Type-1 and type-2 worksheets are offered in series and summation format respectively. 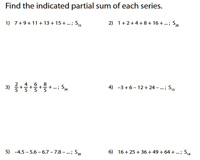 Based on the given nth partial sum of the series, find the indicated partial sum by substituting the value of n.
These worksheets require students to find the infinite sum (S) of the series with the given nth partial sum. 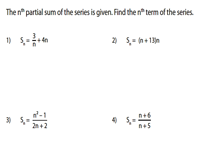 Additionally, determine whether the series converges or diverges based on the value of S.
Based on the nth partial sum of a series, students can find any value of the term in the series by subtracting consecutive partial sums. 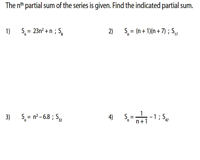 In this set of worksheets, the nth partial sum of the series are given. 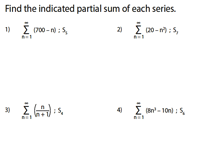 Find the nth term of the series.